Numerous solutions for virtual visits exist: immersive videos viewed using a virtual reality headset, for example, 360° images, etc. However, this type of equipment is very limited at the level of interactions and presents fixed environments that are far from the dynamic everyday life of the real world. The so-called immersive experience remains limited and impersonal. Teleport your partners to the heart of your production site with BEAM! What could be more immersive than to open the doors of your production to them in remote access and real time? The virtual visitor takes over the controls of the BEAM robot, moves around the remote location in real time and can talk to people on-site, whether these are your own personnel or other visitors who are physically present. a mobile base that allows visitors to move around in a space as if they were really there. Log in to the BEAM app from your computer, tablet or smartphone! Control your BEAM robot remotely and interact freely! “AWABOT and Entreprise DU FUTUR – it’s all about “PHYGITAL”! The telepresence of BEAM robots has given the Entreprise DU FUTUR networking site a valuable tool that shows off our vision of the phygital world: a fully merged interaction between the physical and the digital in the service of a unique user/customer experience! 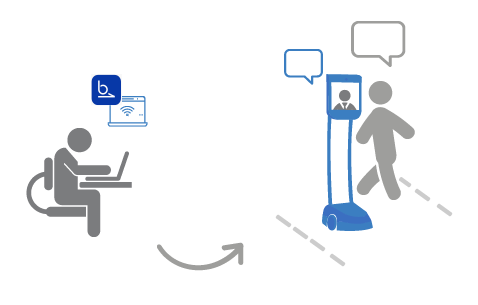 Designed by Suitable Technologies and distributed by Awabot, BeamPro is the robust, reliable telepresence robot for highly frequented and/or noisy spaces.